Bolton DP Destitution Project Seeking to provide a safe environment where Refugees and Asylum Seekers can find friendship, food and practical help. "Seeking to provide a safe environment where Refugees and Asylum Seekers can find friendship, food and practical help." English Teachers - the Destitution Project is looking for experienced English teachers who would like to volunteer to teach beginner or intermediate/advanced classes for our service users. Classes are up to 2 hours long and take place on Wednesdays at various times and we currently have 2 levels for women and 2 levels for men. Each volunteer teacher would work with one class, and likely be part of a small team of teachers (some of whom are not trained in teaching English). We also try to provide one-to-one instruction throughout the day for those service users with very little English knowledge. Reception Volunteers - the Destitution Project is in need of volunteers to man our reception desks each Wednesday. This would require you to be present between 9.45am and 3.00pm. You will need to have good interpersonal and organisational skills, and like to meet and greet people but also comfortable ensuring that access to the Drop-In Centre and its services are well managed. You will likely work as part of a two-person team. Previous experience in this sort of task would be ideal, but not essential. You must be 18 and over to apply. A single point for refugees to find information and for NGOs to provide it. 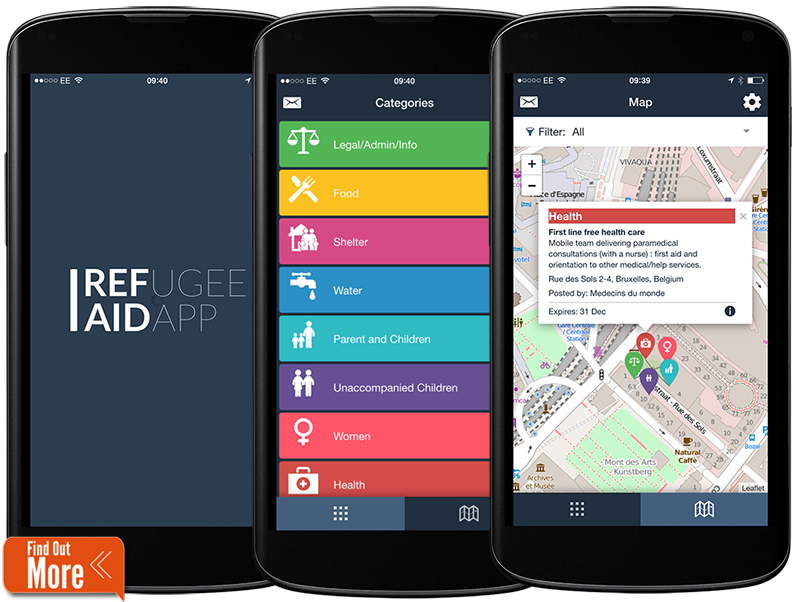 The Refugee Aid App mobile app shows migrants, refugees and aid workers where services are closest to them on a map with a very simple interface. A web based content management and communication system allows official aid organizations to manage and update their services and to get their critical aid to where it is most urgently needed. Copyright © 2015 Joomla!. All Rights Reserved. Powered by Bolton DP Destitution Project - Designed by JoomlArt.com. Bootstrap is a front-end framework of Twitter, Inc. Code licensed under Apache License v2.0. Font Awesome font licensed under SIL OFL 1.1.